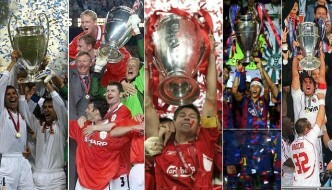 Individual rivalries have always existed in every sport and they continue to exist up till now. 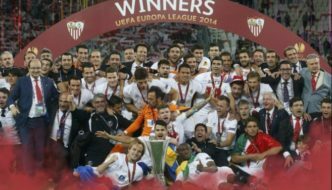 People around the world have seen great and intense and emotional battles across the entire spectrum of sports. 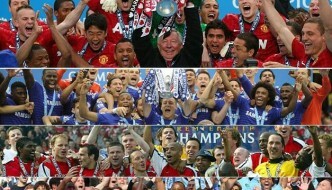 These rivalries have always produced something spicy for the media and for the fans to look forward to. We have seen the most intensely fought battle in the boxing rink between Muhammad Ali and Mike Tyson and who can forget the famous rivalry between Borg and McEnroe when both the guys played out of their skills to win the crown of Wimbledon. And if all this is not enough, then at least every one will be familiar of Ronaldo-Messi rivalry and their commitment to become the best in the world. However talking about cricket, no doubt that it is a team sport, but it has always been full of battles with in battles which have always kept the fans on the edge of their seats. So we are going to have a quick look at the major cricketing rivalries, where match situation became lees important and the player battle dominated the affairs. India and Pakistan have always been arch rivals in every dimension of affairs be it political, religious or cultural. This rivalry emanating from the glaciers of Siachen and sinks in the Bay of Bengal has gripped the two nations in it since seven decades. 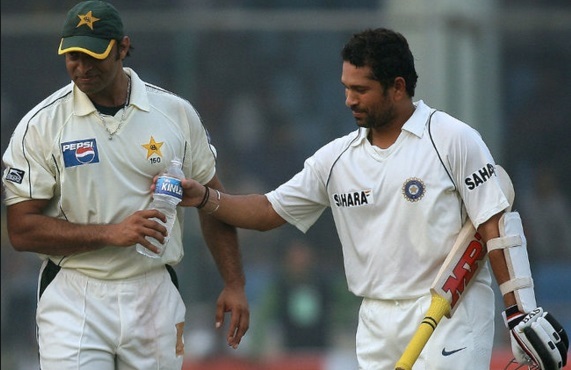 Well cricket seems to have done no good in diluting the tension between the two countries rather it seems to have exacerbated the situation more often than not and “Sachin-Shoaib” rivalry is a testament to this reality. In the famous ground of Eden Gardens at Calcutta, in the midst of deafening audience of 100,000, something happened, which gave birth to a rivalry which was going to last for over a decade. Sachin’s middle stump got uprooted and the Eden Gardens ground got absolutely deserted. This rivalry continued for years. Both these players have faced each other in subsequent world cups and bilateral series. Regardless of how much hype the media of India and Pakistan create about the traditional Indo-Pak rivalry and the spice of politics that it carries, pundits from Australia and England have always abolished their narrative and the have refuse to believe that there can be any bigger cricketing rivalry than ASHES. There is absolutely no point in denying the historic legacy of Ashes series. And this series has produced some of the historic cricketing masterpieces. A prominent one among these is the famous KP-Jhonson tussle. Kevin Pieterson a fiery and instinctive batsman with big heart and had smashed different bowlers across the spectrum in almost every In 2010-11 Ashes series, England was almost like a juggernaut which absolutely decimated the Aussies and so was Kevin Pietersen. KP was coming on the back of a great double century in Adelaide but Johnson managed to pick him up on duck in Perth. Yet Pietersen managed to smash Johnson all across the park in Melbourne in the following test match. But this was only the episode 1 of the season. 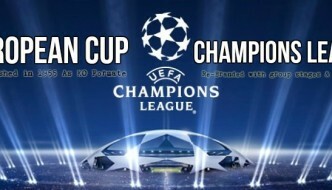 We all know that rivalries like these don’t terminate after a series or two. 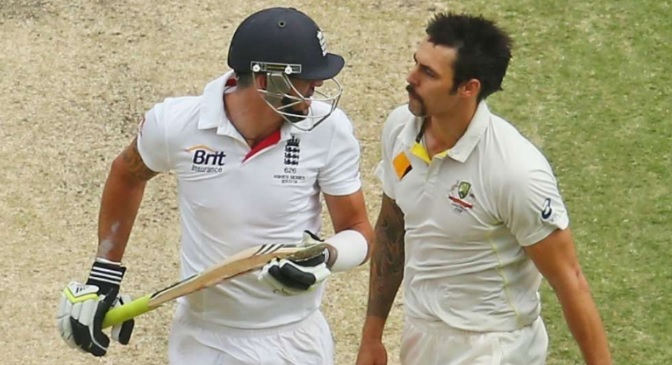 The animosity kept on amplifying in their hearts and minds and one could tell that we were in for something special when England went down under for 2013-2014 Ashes. This time Johnson was a man with grown mustache and stature in the world of cricket. Mitchell Johnson had absolutely transformed in these 3 years and so had the fortunes of Australia. He had created panic in the ranks of England and KP was no exception to it. They both had heated arguments on the field but Johnson had the last laugh as he absolutely demolished the stumps of KP. Australia was able to regain ASHES after 5 years, thanks to the fast and furious Mitchell Johnson. And who else can he be other than the little master Sachin Tendulkar. Whenever there used to be a game between India and Australia, the media always made sure that it’s not just India vs Australia. 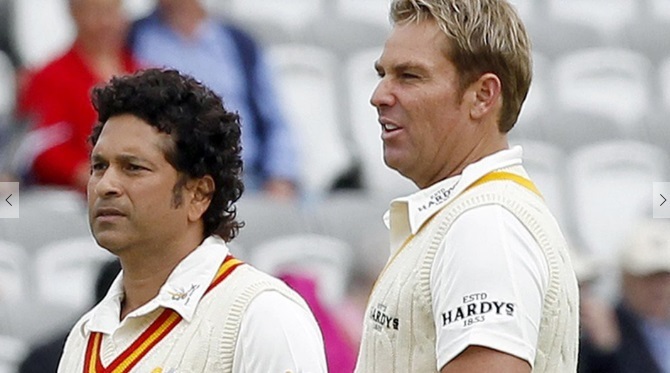 The media and cricket pundits always wanted Sachin and Warne to lock horns with each other. And hence these iconic cricketers had always had a point to prove to each other. But the stats are clear indication of the fact that Sachin has got the better of Warne on numerous occasions. In 1996 world cup, Shane Warne got some serious beating at the hands of Sachin. There famous punch up in test cricket occurred at Chennai in 1998 where everyone could see the two cricketers fighting for supremacy over each other. Wanrey won the 1st round of battle by picking up Sachin early in the piece at a score of mere 4 runs. But Sachin reciprocated by hammering Warne in the second innings and scored memorable 155 runs. In his innings he was never afraid of advancing down the track against Warne. Moreover Warne’s ploy of coming around the wicket didn’t help one bit as Sachin kept on using his feet to get to the pitch of the ball and hence negated Warne with the advantage of rough patch. Sachin also hammered Warne in test match at MCG in 1999 and to Warne’s dismay; he didn’t had much success against Sachin at later stage of career as well. 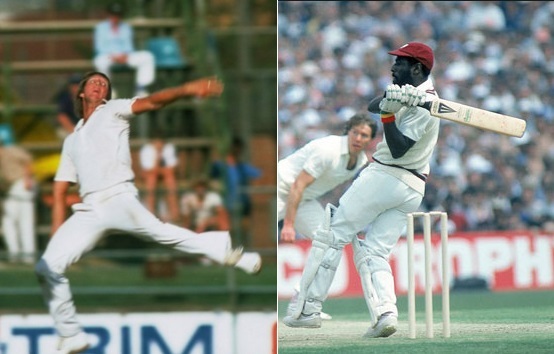 Viv Richards is a phenomenon of 70s and 80s which cricket pundits have failed to comprehend. The kind of brutality with which this man bated is beyond the senses of every one. It’s almost impossible to believe that an era in which batsmen were content with occupying the crease rather than trying anything extravagant, this man actually hit the bowlers out of the park to stamp his authority. Well actually words can’t describe this man’s genius and no author will be able to do justice with the enormous amount of talent that this man possessed. On the other hand there was a bowler called Jeff Thomson with an uncharacteristically unique action, who would gather all his power in shoulder and would hit the deck extremely hard. He is the fastest bowler of that era. The magnitude of his pace could be estimated by the fact that once he bowled a bouncer to Tony Creig at Perth, which bounced halfway at the pitch, flown above the batsman and keeper’s head, bounced just inside the boundary line and smashed into the advertising hoarding. So it was always a spectacle to see these two titans facing each other, and the most epic battle between these two happened at 1983 world cup where Viv Richards showed why he was and is the greatest batsman world has ever seen. The two great players of their era and the superstars in their respective countries, the great Imran Khan and the little master Sunil Gavaskar actually defined the way the cricket would be played in their respective countries. 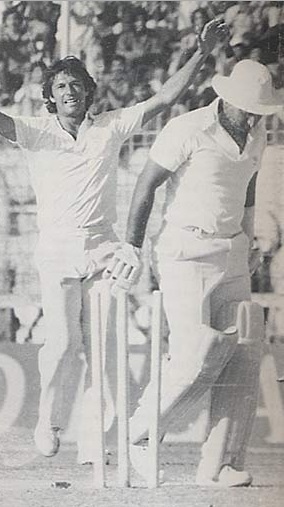 One was pioneer of reverse swing and perhaps among the fastest bowlers of 1980s along with Jeff Thomson and Michael Holding and the other was a complete batting genius who could take on the likes of Andy Roberts, Collin Croft, Michael Holding and Malcom Marchall in their own backyard without helmet. Besides the cricketing abilities of these two icons, they had the charisma to inspire millions across the sub-continent. Imran Khan being a fast bowler was able to inspire a generation of upcoming fast bowlers, which led to the production of brands like Wasim, Waqar, Shoaib, Sami and this continues till Amir and Irfan. Whereas Sunil Gavaskar was able to captivate the imagination of every Indian and this led to the production of Sachin, Dravid, Sourav, Laxman and recently to some of modern ones like Kohli and Sharma. And when these two men would come across each other, the whole sub-continent would come to a standstill. Gavaskar had his fair share of trouble against Imran in 1982 series against Pakistan where Imran picked him up several times. Moreover Imran picked Gavsaskar in the crucial matches in Sharja as well, the most prominent of them being in four nation cup in 1984-85 and in the famous Australasia cup final in 1986 (the game which Javed Miandad won by hitting last ball six). Brian Lara is considered as the most stylish and flamboyant batsman of modern era. He was a cricketer with naturally gifted abilities, renowned for his unique batting stance which comprised of excellent trigger movement complemented by eye catching bat lift. His numbers are a testimonial to his greatness. And in his era, there was a bowler for whom it was impossible to miss his mark. Yes, the prodigious Glenn McGrath who could bowl 17 maiden overs in a day. He always made sure that he pitched the new in the corridor of uncertainty. He would keep on iterating same line and length to irritate a batsman. In short he tested the batsman’s temperament to full extent. And to negotiate with the threat posed by McGrath, you needed a batsman of Brian Lara’s calibre. Both these illustrious cricketers have had many face offs in international cricket. Both of them realized the gravity of each other and they made sure that they are at the top of their game when up against each other. 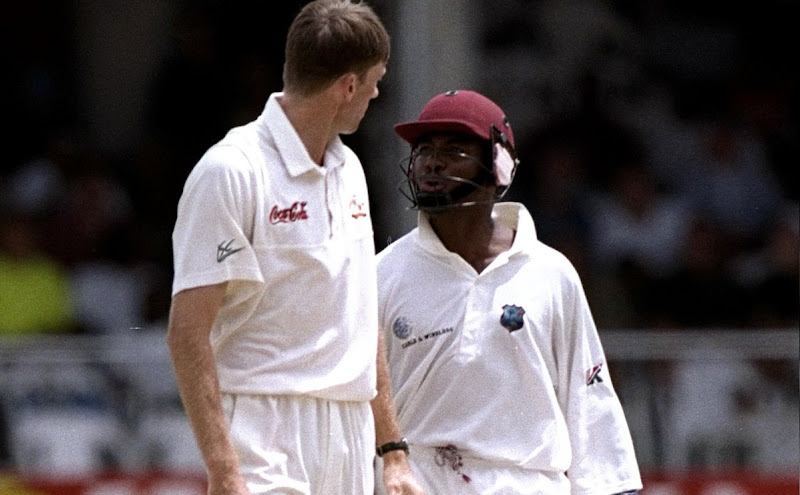 The test series at Caribbean in 1999 was the point when the rivalry between these two legends became famous. In March 1999, Kingston Barbados was the ground where Lara scored famous 213 runs against Australia and McGrath was punched into oblivion by Lara. And then in the next match at Bridgetown, Lara probably played the innings of his life time. West Indies needed 308 runs to win and Lara came in at 78-3 and played a brilliant knock at 153 runs under extreme pressure and West indies went on to win the match by one wicket. If this was not enough, then there came an absolutely scintillating and destructive piece of batsmanship from king of Caribbean as he played an explosive innings of 100 from 82 balls in which he left Glenn McGrath and other Aussies flabbergasted. He smashed McGrath all over the park and hit 15 fours and 3 sixes. But it didn’t take long for McGrath to redeem himself and he picked him up in that innings and later in the 2nd innings he dismissed Lara for only 7 runs. And the biggest triumph came for McGrath in 1999 world cup game at Manchester where he bowled Lara at 9 runs. He also picked Lara cheaply in the Champions Trophy final in 2006 at Mumbai. The rivalry continued in the years to come and both players had their moments against each other. Overall McGrath picked Lara 18 times in international cricket. Even though it takes some time for rivalry to establish some roots in world of cricket but if it happens to be a world cup quarter final and the bowler is all fired up and is desperate to get under the skin of the batsman and the batsman is so resilient and determined to win a place in semi final for his country rather than losing temperament and starting war of words with the bowler, then you know you are in for something special. This is exactly what the script was in 2015 world cup quarterfinal at Adelaide. Pakistan was batting first in the match and Wahab Riaz was finding it difficult to negotiate with Australian bowling attack. This is when Shane Wastson tried to irritate Wahab Riaz but what he didn’t knew that this mischievous act would fire up Wahab Riaz. Hence it was obvious for a Lahori to reply in typical style. So later in the evening when Watson came out, Wahab was confident and all fired up. Hence came the cannon that started bombarding continuously at Watson. He bowled a lot of perfume balls to Watson and also targeted the rib cage of Watson. Watson did all ugly things that a batsman could do in an innings. There were many instances when Watson almost took his eyes off the ball. Watson didn’t knew how to handle that hostile pace and aggression from Wahab and in the process, he played one up in the air towards deep square leg but unfortunately for Wahab’s sake, the catch was dropped even thought it was a sitter. I think we all know the gentleman who dropped the catch. After that lapse, Watson managed to get though that period of torment and inferno and played with full focus and determination and made sure that he took his side home. Well every one praises Wahab Riaz for the kind of spell he bowled at Adelaide but people never appreciate the amount of effort that was put in by Watson to play that spell. However this rivalry didn’t end here as both these guys came across each other in Pakistan Super league again recently and Wahab Riaz got his revenge in the “Ring of fire” in Dubai.